Aphria Inc. (NYSE: APHA and TSX: APHA) is set to release its financial results for the fiscal third quarter and nine months ended February 28, 2019 on April 15, 2019 before market open. This will be the second time the company reporting earnings after it started trading on NYSE from November 2, 2018. For the second quarter ended November 30, 2018, the pot producer reported earnings of C$54.8 million or C$0.22 per share compared to C$6.5 million or C$0.05 per share in the previous year, helped by the gains on long-term investment portfolio. 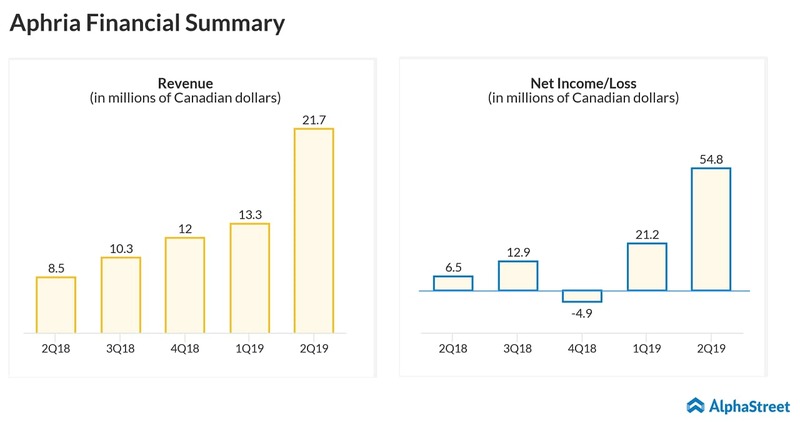 Revenue jumped 63% year-over-year driven by a 92% increase in kilogram equivalents of cannabis sold and an additional C$1.6 million of non-cannabis international sales. By the end of calendar 2019, Aphria expects annualized harvest to increase to 255,000 kilograms versus the current capacity of 35,000 kilograms. The company sold 3,408.9 kilograms equivalents of cannabis in the second quarter of 2019. When Aphria reported its second quarter results, the company also announced that its long-time CEO Vic Nuefeld and co-founder Cole Cacciavillani will transition out of their executive roles over the coming months but remain on the Board. The Board had requested Neufeld and Cacciavillani to continue as special advisors to both the Chair and the President, ensuring a smooth transition until a new CEO is appointed. In December 2018, Aphria shares got hammered following a report from Hindenburg Research, which stated that Aphria’s LATAM acquisition is worthless and accused that a network of insiders of Aphria diverted funds from shareholders and put them into their own pockets. In December, Aphria rejected Green Growth Brands’ $2.1 billion (C$2.8 billion) buyout offer stating that the latter’s proposal undervalued the former. The Canadian government has committed to regulate the sale of cannabis infused products in 2019. Based on customer behavior and product preferences demonstrated in other existing legal markets, the Ontario, Canada-based cannabis firm believes cannabis infused products could represent more than 50% of the total cannabis market upon becoming federally legal in Canada. Earlier this month, Aphria’s German subsidiary received a license for the domestic cultivation of medical cannabis. Cannabis companies have started focusing on beauty area. On April 1, Aphria launched CBD-based cosmetics product in German market. Market watchers expect the new deals and the increasing presence in the international markets will benefit the company. Aphria stock, which ended Friday’s trading session by increasing 2.96% at $10.10, had gained 81% since the beginning of this year.